Global property prices rose by a healthy 6% in 2016, according to the latest Knight Frank Global House Price Index. This ranks as the highest increase since Q1 2014 and occurred against a background of uncertainties, both on the political and economic front in the world last year. The Index also reveals a change-round in global leaders and rising stars. 2016 is likely to go down as one of the most uncertain years in recent history. Financial challenges combined with political upsets characterised the year. However, despite this, global property prices registered an average rise of 6%. Furthermore, the number of countries recording positive growth in their housing markets rose to 47 out of the total 55, four more than the 2015 Index. The leader of global property prices in 2016 turned out to be Iceland. Thanks to improved economic conditions and a sharp rise in foreign interest in property in Iceland, prices went up by a massive 14.7% last year. Iceland’s surge usurped Turkey and Sweden from their 2015 positions. In the case of Turkey, the country went from leading the rise to global property prices to fifth position. Knight Frank attributes the fall to higher interest rates and concerns over security. However, despite these impediments, Turkey property prices still registered a rise of 12.2% in 2016. Sweden’s fall was even bigger. The Scandinavian country dropped to 22nd position in the table from 3rd place in 2015. However, like Turkey, Sweden too recorded a healthy rise – property went up by 6.1% last year. 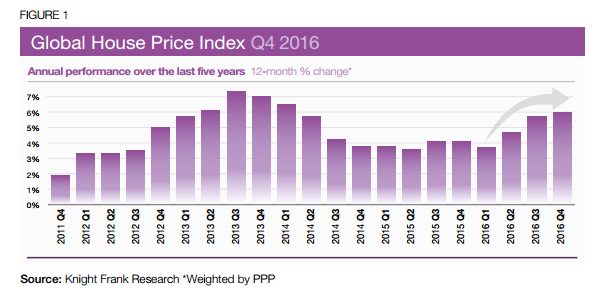 Important shifts took place in the global property price index for 2016. One of the biggest movers was China. The Asian giant scaled a total of 36 positions to reach 7th in the table, up from 43rd in 2015. Property prices rose by 10.8% on average in China last year. The Baltic States are also movers when it comes to global property prices. Knight Frank reports that the three countries now feature in the world top 10. Their average property price rise of 9.9% lies well ahead of the European average of 5.4%. The surge of interest in property in Lithuania, Latvia and Estonia makes the trio “a key focus of growth in Europe”, according to the Index. At the other end of the scale are the losers when it comes to property price rises. However, in keeping with the better health of the global market, just eight countries recorded negative price growth last year. And three of these – Greece, Japan and Italy – registered a drop of less than 1%. Other countries, however, fared less better. The Ukraine continues to occupy its place at the bottom of the table. Prices plummeted by 10.2% in 2016. Taiwan ranks next in the table with a 6.5% decrease in prices. Singapore (-2.6%) and Cyprus (-1.3%) complete the final four. Knight Frank believes these figures are due to a combination of weak growth and cooling measures. What’s in store for the Ceara property market in 2018?